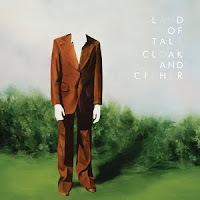 Atlas and the Anchor: Land of Talk - "Cloak and Cipher"
Land of Talk, led by songwriter/vocalist Elizabeth Powell, is set to release their sophomore album, Cloak and Cipher, today on Saddle Creek Records. After touring with fellow Canadians Broken Social Scene as the opening band, Elizabeth also joined the band on stage each night and it seems like their big, anthemic sound has influenced the new record. Cloak and Cipher is more electric and eclectic with complex arrangements and huge choruses and features guest spots from members of Arcade Fire and Stars as well as production from Jace Lasek of Besnard Lakes. The title track “Cloak and Cipher” opens the album with well placed piano chords, shuffling drums, and a woozy chorus that sets the tone for the album. “Goal Time Exposure” is a song of two parts, the first with icy guitars and layers of melancholic vocals and the second, a lush burst of strings and sunny vocals on the chorus. Standout track “Quarry Hymns” chugs along softly with drums from Jeremy Gara of Arcade Fire and Elizabeth’s coy vocals. The fiery first single, “Swift Coin” features wild guitars that capture the band’s raucous onstage energy. “Color Me Badd” is not a smooth R&B jam but rather an atmospheric anthem with horns played by Evan and Chris from Stars that propel the song. “The Hate I Won’t Commit” explodes with noisy, angular guitars streaked with sweet, emotive vocals and a distorted piano solo from Patrick Watson, as a perfect example of the bands’ sense of risk and complexity. Elsewhere “Blangee Blee” is buoyant and driving with power-pop riffs galore and “Playita” channels Tom Petty with jangly guitars, a laid back vibe and sun drenched harmonies. “Better and Closer” closes out the album with a glassy lullaby of longing. Critics swooned for their debut, Some are Lakes but with the excellent Cloak and Cipher, Elizabeth and her band have set their own standard even higher.